Good news, Crackdown fans: The signature voice of the 2007 Xbox 360 game is back for this summer's sequel. Better news: He's not sick this time. Michael McConnohie was the no-nonsense voice of The Agency, the seemingly benevolent (or were they?) police force of which the playable hero of Crackdown was an officer. McConnohie's voice, booming from a character unseen in the game, told the player what to do and just how right the fight was. As far as crime-fighting commanders go in open-world games that have you running over, shooting and blowing up the lowlifes of a place like Pacific City, he was convincing. But McConnohie had a cold when he recorded his role for the 2007 Crackdown. The sequel's executive producer, Peter Connelly, who also worked with McConnohie for the first game, told Kotaku last week that he noticed that his actor sounded different while recording Crackdown 2. That's because, McConnohie told him, he wasn't sick this time. The veteran voice actor, who has done voices for games as disparate as Descent 2 and World of Warcraft, soldiered through his original Crackdown recording despite a cold. During a demo of Crackdown 2 that Kotaku saw last week, McConnohie's voice was back and barking orders some more. He was reminding me which abilities I could use and advising me on missions, all canned of course, and apparently less congested than last time. The actor — and his character — weren't just brought back to the Crackdown series for consistency but for as-yet-unrevealed development of both the Agency leader and the plot of the game. All Connelly and Crackdown 2 developers at Ruffian Games will say so far about the new game's plot is that it occurs a decade after the first, with Pacific City overrun by a new gang, the Cell and a populace that has been infected and transformed into night-loving monsters. Connelly, though, teased that we will know more about the Agency leader and his organization, an assurance that the first game's finale plot-twist won't be ignored, even if the fact that the player is in control of a new crime-fighting Agency super-cop at the beginning of this game makes it seem like that could be the case. The plot continues in Crackdown 2. The Agency is back. The leader is around, and this time, if nothing else, he will sound more healthy. 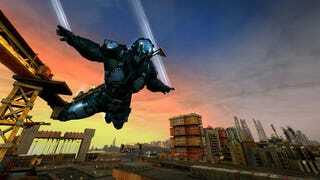 Crackdown 2 ships for the Xbox 360 in July.